Help your early learners develop foundational science literacy in just 15 to 20 minutes a day! Support standards-based science literacy in your early learning program with daily lessons targeting earth, life, and physical sciences. 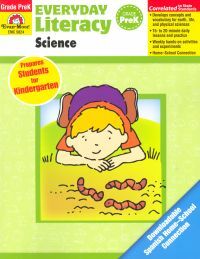 Everyday Literacy: Science provides fun, focused lessons that help young students learn key concepts and vocabulary through listening, speaking, reading, and writing activities. Early learners will love the engaging topics while teachers and paraprofessionals will enjoy the helpful teacher support, easy-to-follow teaching path, student evaluation forms, home-school connection activities, and more! Brand New Copy. Ships next business day and we email you Delivery Confirmation Number!